The term “cookbook” is perhaps a misleading one. A good cookbook of course needs to be cooked from - to be a practical kitchen guide and an inspiration. But, for me, the mark of a great cookbook is one that can be used in the kitchen and taken to bed and read. The prose should be as delicious as the food it describes. 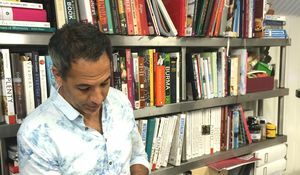 Cookbooks are to be devoured. Nigella Lawson’s How To Eat, which I was given for my sixteenth birthday, fulfils both criteria. My copy is now dog-eared and fat-flecked, so it has stood the test of time physically, but also as a kitchen companion. When I was a teenager, Nigella became my go-to for simple, revision-friendly stir-fries, a particular tomato and rice soup, my friends’ birthday cakes; and, latterly, her tips for feeding crowds, comfort food ideas, and recipes like ham in coca cola which I return to time and again. From How To Eat, I learnt that I enjoyed reading about food as much as I liked cooking and eating it, but it’s also a lesson in how good food writing doesn’t demand sumptuous photography to be a commercial success. 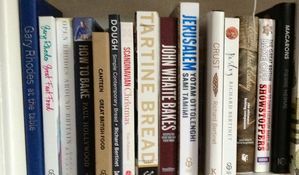 Indeed, another feature of many of my favourite cookbooks is the absence of pictures. was quite late to the Laurie Colwin party, but boy did I join in when I heard about it! When Home Cooking was republished by Fig Tree in 2011, I was asked to review it for The Observer without ever having heard of her. Colwin was an American novelist who died in 1992. She was a committed home cook and this collection of essays, which run a gamut of themes from English Food to feeding vegetarians, bizarre recipe creations for one and mastering deep-fried chicken “that makes you want to stand up and sing the Star-Spangled Banner” has all the ingredients for a moreish and un-put-downable book. Her writing is no-nonsense, relatable, acerbic, and full of useful advice for the home cook, with approachable recipes. 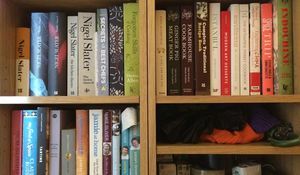 Laurie Colwin and Nigella Lawson have in common an emphasis on domestic cookery, and an awareness that food is to be eaten, not just salivated over. I try to keep this in mind in my own work, writing and editing. Unsurprisingly, I also love - and return often - to the likes of Jane Grigson, Claudia Roden, Ruth Reichl, Jeffrey Steingarten and Elizabeth David, and perhaps have a particular weakness for American food writing - anything by Adam Gopnik, Nora Ephron or Jane Kramer on the subject of food (hello, New Yorkers!) gets a thumbs-up from me. I’m also very fond of Jay McInerney’s hysterical writing on wine; books like The Juice - which compile many of his columns for The Wall Street Journal - make a notoriously turgid subject accessible to more than just oenophiles. I adore my copy of the Chez Panisse Menu Cookbook, which actually isn’t my copy. It’s a first edition I found on Telegraph Avenue in Berkeley - the Bay Area city that Chez Panisse calls home, and where I spent a year of university - which I sent to my Mum for her birthday when I was living there. Appalling though it is, I have since pilfered it (sorry, Ma). It comes complete with an explanation of Alice Waters’ culinary philosophy (seasonal, local food born of Waters’ values about “community and personal commitment and quality”), recipes for Californian takes on gratins and cassoulets, galettes and crepes, uses for a whole host of seasonal produce, and peppered with Art Nouveau style illustrations. It's a superlatively beautiful book. I grew up on a cocktail of family recipes (including many of my paternal grandmother’s, pictured above, all scribbled down on the back of cereal packets), Cranks and Rose Eliot (my mother and I were vegetarian) and Delia Smith’s Book of Cakes. To this day, I’m convinced her brownie recipe is the best. My favourite recipe books of recent years are, I realise now, brilliant at finding novel ways with vegetables (though not necessarily vegetarian). 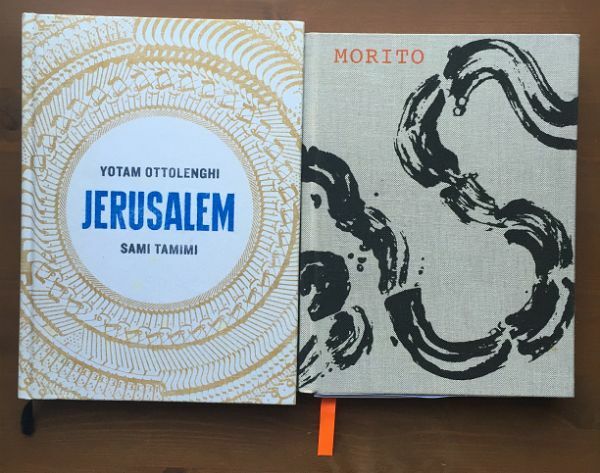 All of Yotam Ottolenghi's works, Morito’s incredible tapas book from this year (try 4 seasons of tabbouleh and the carrot, caraway and feta salad), self-taught Anglo-Persian cook Sabrina Ghayour’s blockbusting Persiana, eco-chef Tom Hunt’sThe Natural Cook and Anna Jones’ A Modern Way To Eat are all books that have informed my own home cooking and which we’ve used many a time in Guardian Cook. I rather pretentiously describe myself as ‘prefertarian’ - I eat relatively little meat, so inspiration for meals that don’t revolve around it are always welcome. This is definitely reflected in Cook - we make sure that vegetarians are amply catered for. 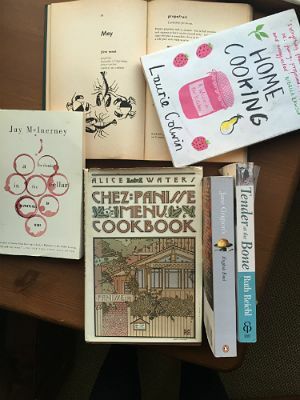 Food writers I’m particularly excited by include Rachel Roddy (her blog on cooking from a kitchen in Rome is making it into book form in 2015), Rebecca Seal, Rosie Birkett and Meera Sodha as well as some of our brilliant columnists like Henry Dimbleby, Ruby Tandoh, Sophie Missing and Caroline Craig. All their books are currently, or about to be, sitting on my shelves - to which there is little order, as you will see. However, this organised chaos of books (resplendent with My Little Ponies cantering through them), makes me very happy. It is a tangible reminder of why I do what I do, and why I love it. It’s a wildly inspiring world of which to be a part. Mina Holland is editor of The Guardian Cook and author of The Edible Atlas. Find her on Twitter and Instagram.